The properties that we rent is composed of 4 houses and can be reached through 500 meters of dirt road kept in good condition arriving in the parking lot that can accommodate 5 cars. 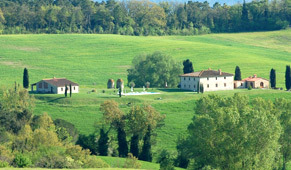 Up to the farm, the little house on the right is used as a restaurant which will be open only for you if you wish to use the service of breakfasts, lunches, dinners and cooking classes. Adjacent to the restaurant, there is another house used as a laundry room with washing machine, iron and ironing board. 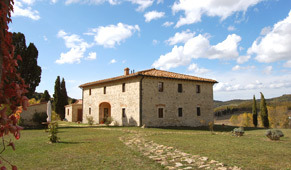 In front of the laundry there is the house that will be the rental villa for your holidays in Tuscany. Between the restaurant and the house rent we placed a table in mosaic where you can dine in the evening to watch the sunset. Beyond the house there is a rooftop pool with sun umbrellas. At the end of the property there is the house where we live: Paola Valerio, ensuring maximum privacy for guests. In fact, when the house is rented, we do not use the garden of the house nor the pool, but we are always on hand for any need. 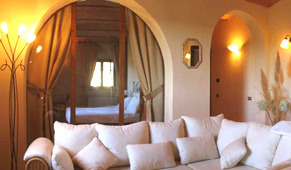 The Holiday Villa offers three well-appointed apartments and two well-appointed rooms with en suite bathrooms: the spacious Alabaster apartment, the Green Room and the Pink Room are on the ground floor; the Rosso Fiorentino apartment and the Sunflower apartment are on the first floor. 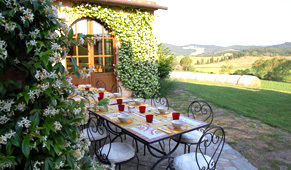 The villa has a garden of 5000 square meters and is located within a nature reserve where you can find deer, wild boars, foxes, hawks, pheasants, herons, hares, hedgehogs and porcupines.